Pacific Gold is a popular brand of jerky, currently produced by Oh Boy! Oberto. The brand originally got its start in 1985 based out of Hayward, CA. The company got its early success from supplying its teriyaki beef jerky into Price Club in 1986. Over the next 12 years, they were able to get their products into several locations, and grew the business to 300 employees. Eventually, the fruits of their labor beckoned too great, and they sold the company to an investor group, who later sold it to Oberto. If you look at Pacific Gold's website, they don't actually list this "Turkey Tenders" product. In fact, the packaging doesn't even use the word jerky. Instead they describe it as smoked turkey breast, though it's clearly jerky. I haven't seen this Turkey Tenders product in any stores; I found it at the Oh Boy! Oberto Factory Store in Seattle. I don't know if this is a very new product, or if it's a very old product. But, Pacific Gold already markets a turkey jerky, in a different looking bag, with the words "turkey jerky". Turkey breast, soy sauce, brown sugar, worcestershire sauce, corn syrup, sugar, pineapple juice, flavorings, salt, natural hickory smoke flavor. The tastes I pick up from the surface is a sweetness, and a faint bit of smoky. Moving into the chewing, I pick up some saltiness, and more sweetness, and something similar to soy sauce. I do get a teriyaki flavor. If anything strikes me with this teriyaki turkey tenders, it's that it tastes very much like Oberto's own turkey jerky. I don't have a bag of Oberto's turkey jerky to do a side-by-side comparison, but I've had their turkey jerky and I want to say that this tastes exactly the same. The meat consistency looks exactly the same also. As a teriyaki variety, I suppose there is indeed a teriyaki flavor to this, but nothing what I'd consider geniune teriyaki sauce. But it does have the combination of sweet and soy sauce that do seem to fuse together as teriyaki, and it even has that slight pungent taste that normally comes from ginger. I don't really taste the natural turkey meat flavors in this, but I do get an aroma of turkey meat, if that makes sense. That is, I don't pick up any turkey flavors on my taste buds, instead I pick up the aroma that moves into the back of my mouth, and are picked up by the smell receptors in my sinuses. Or maybe, I'm just over-analyzing this. Either way, there is a turkey flavor to enjoy here, but not necessarily as taste. I can also see tiny flecks of black on these pieces, perhaps black pepper, but I don't necessarily taste that on a single piece. I do get a slight aftertaste through eating several pieces, but just slight. 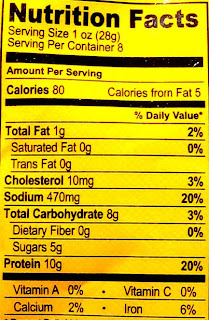 Overall, this jerky is dominated by a teriyaki flavor, with the salty flavor coming in second, and not much else after that. These appear to be slices of whole meat, sliced into average thickess, and in small, medium, and large sizes. Several of the pieces in this bag are large, perhaps slices of full breast. 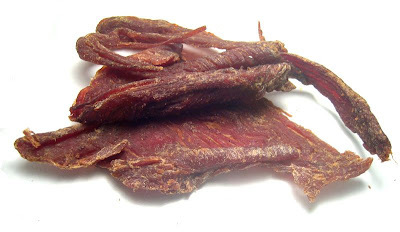 This is a soft and tender jerky, being somewhat moist. It's easy to tear apart, and fairly easy to chew. The chewing texture of this stuff is similar to dry turkey breast. Though it's not really dry like a roasted turkey breast. There's a chewiness to it, but still with some sense of being turkey meat. For the most part, it's clean eating, with no residue on my fingers and nothing falling into my lap. It's also pretty lean, I don't see any pieces of fat, tendon, gristle, or connective tissue. I paid $6.99 for this 8 ounce bag at the Oh Boy! Oberto Factory Store in Seattle, WA. That works out to a price of $0.87 per ounce, making this a cheap purchase. 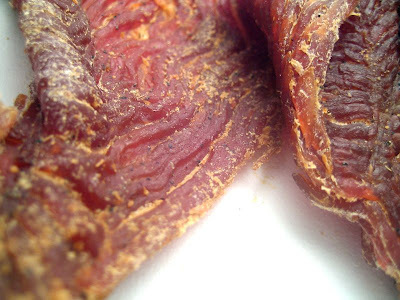 For general jerky snacking purposes, it's a great value. This has a decent flavor, though not a great one. Yet, it's still good enough to be snackable. It's easy to eat, and still seems to have a chewing texture similar to turkey breast. At that low of a price, all it needs is to be snackable to be a great value. As a teriyaki jerky, it's a good value. I do get a teriyaki flavor, but not close to tasting like real teriyaki sauce. It's just enough teriyaki flavor to make this turkey jerky enjoyable, and at this low of a price, it's enough to make it worth the buy. It's basically snackable, but I don't really see anything in this above average. You get a decent teriyaki taste, though not a great one, or even a good one. That's largely all you get out of it in terms of flavor. Not much in natural turkey meat flavors, or any other spices. It does have a decent turkey meat chewing texture, and it is easy to eat, but that just makes it snackable. Perhaps if the teriyaki flavoring tasted more like real teriyaki sauce, and the meat had more natural meat flavors, this could have gotten a "good" rating. Even as a dieting snack, it's a little high on the carbs. For a good companion brew, try a wheat beer, hefeweizen. Oh Boy! Oberto Factor Store, Seattle, WA. Question: is this pack still safely for consumption? thanks in advance for you answer.